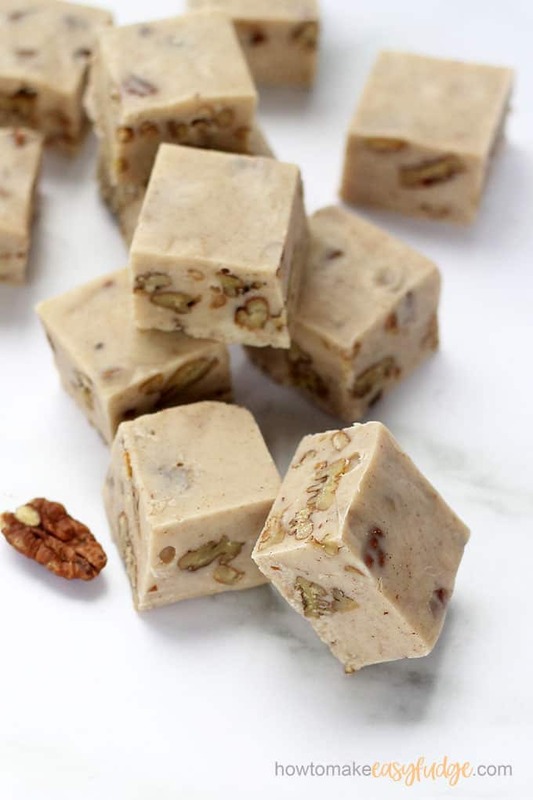 Flavored with brown butter, pecans, and cinnamon, this butter pecan fudge tastes just like the ice cream! Butter pecan fudge may be one of my favorites yet. 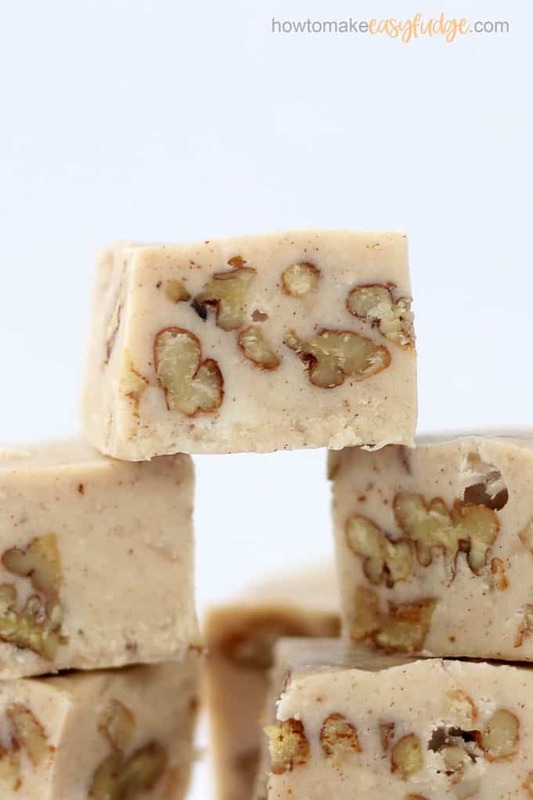 Combine creamy white chocolate with buttered pecans, brown butter, and cinnamon for a perfect, delicious fudge that tastes even better than the ice cream. As a bonus, you’ll learn how to make brown butter, which is useful in many other recipes, both sweet and savory. 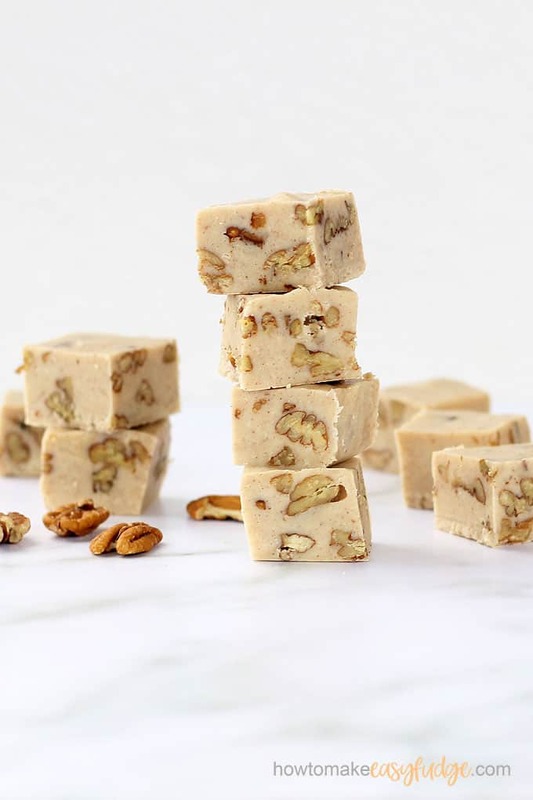 Just like all of our recipes, butter pecan fudge is easy to make, but you may want to check out our fudge FAQ page for tips and tricks. 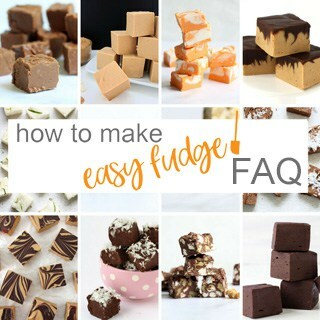 Sometimes different ingredients, such as store-brand condensed milk or store-brand chocolate vs. name brand chocolate, can change the texture of fudge, and it’s helpful to know this before you begin. 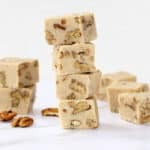 Butter pecan fudge is a simple white chocolate fudge (white chocolate chips combined with sweetened condensed milk) with browned butter, pecans, and flavoring added. Before you begin making fudge, see the tips below on how to make brown butter and buttered pecans. Prepare these first. In a large, microwave-safe bowl place 3 cups white chocolate chips (18 ounces) and a 14-ounce can of sweetened condensed milk. Microwave for 90 seconds at 70 percent power. Use the residual heat to stir the mixture well until the chocolate is fully melted and smooth. This may take a minute or two. If necessary, microwave for additional 15 second intervals. I find that Nestle white chocolate chips melt a bit thinner than Ghiradelli brand. So if you’re using the latter, you may want to reduce the number of chocolate chips to 2 3/4 cups. We have also found that some store-brand sweetened condensed milks can be very thin. 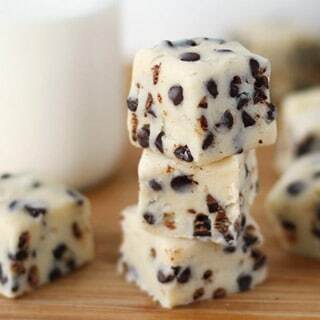 If you think the milk looks thin, increase the amount of chocolate chips to 3 1/4 cups. Please note, the recipe here uses Nestle-brand white “morsels,” which is actually confectionery coating. If you’re using white confectionery coating chips (no cocoa butter listed in the ingredients, use 20 ounces. If using pure white chocolate (with cocoa butter listed in the ingredients), use 24 ounces. 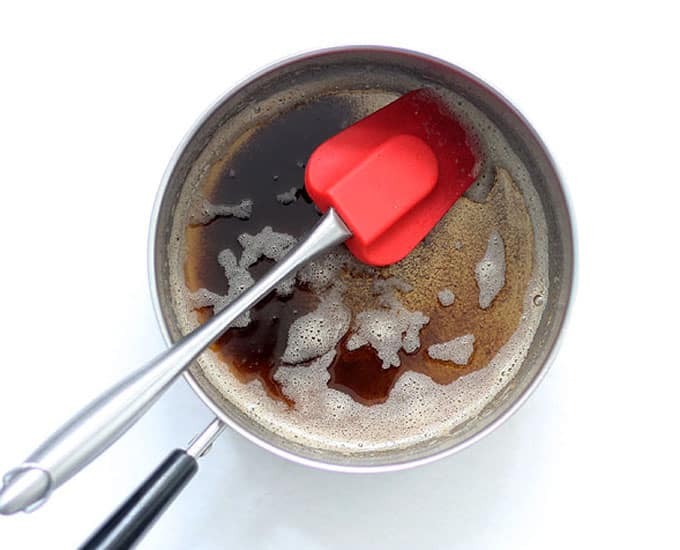 Stir in a generous pinch of coarse sea salt (table salt also works, but use a smaller pinch) and 1 teaspoon of vanilla extract. Stir in 1 teaspoon of ground cinnamon. Stir in 3 tablespoons of butter that has been browned (see below for instructions). 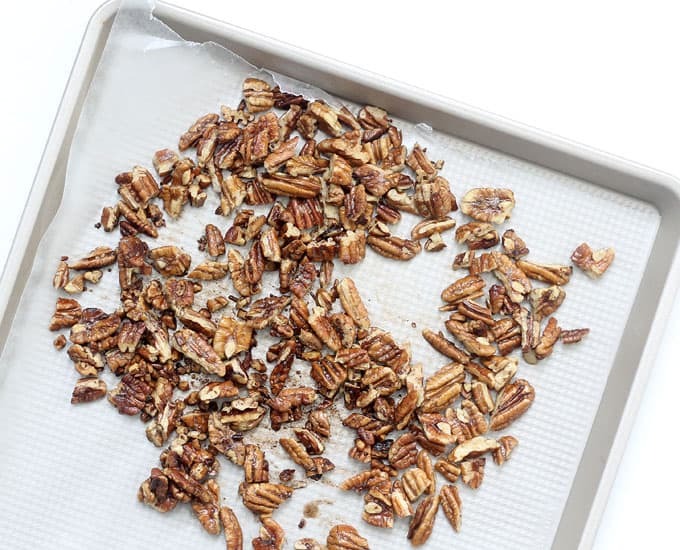 Fold in 1 1/2 cups of buttered pecans (see below for instructions). Scrape the fudge evenly in the prepared pan and chill until firm, 2 hours to overnight. 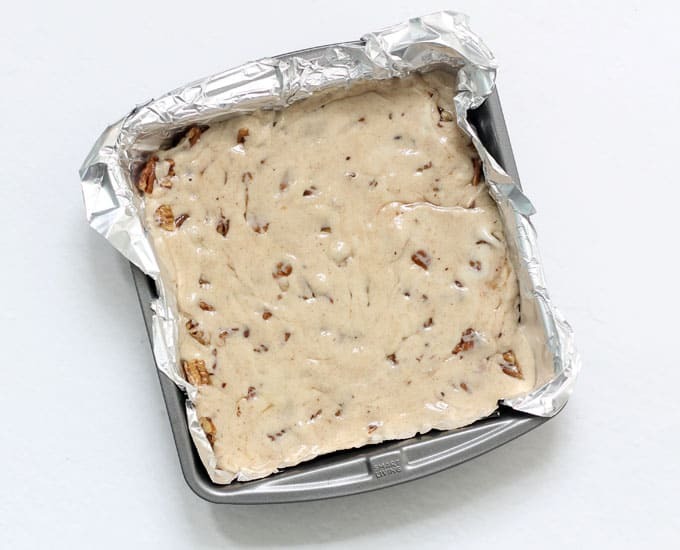 Lift the fudge out of the pan by grasping the edges of the foil and cut into squares. When substituted for butter in a recipe, brown butter adds a rich, nutty flavor to many dishes, both sweet and savory. It’s easy to make by simply melting butter until it browns. 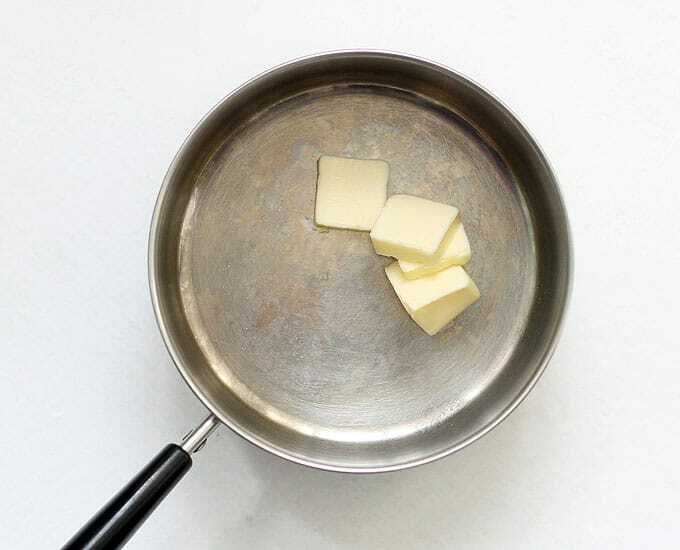 Place your butter in a saucepan with a light-colored bottom, so you can easily note the color of the butter. For the butter pecan fudge recipe, use three tablespoons of butter. Set over medium heat. Swirl the pan or use a spatula to occasionally stir the butter. The butter will foam and then darken to a deep brown. This may only take a few minutes. You will see sediment from the milk solids sink to the bottom of the pan. Transfer the browned butter to bowl to cool, leaving the sediment behind (if possible). But don’t worry too much about sediment getting mixed in with the brown butter. It doesn’t make a significant difference. 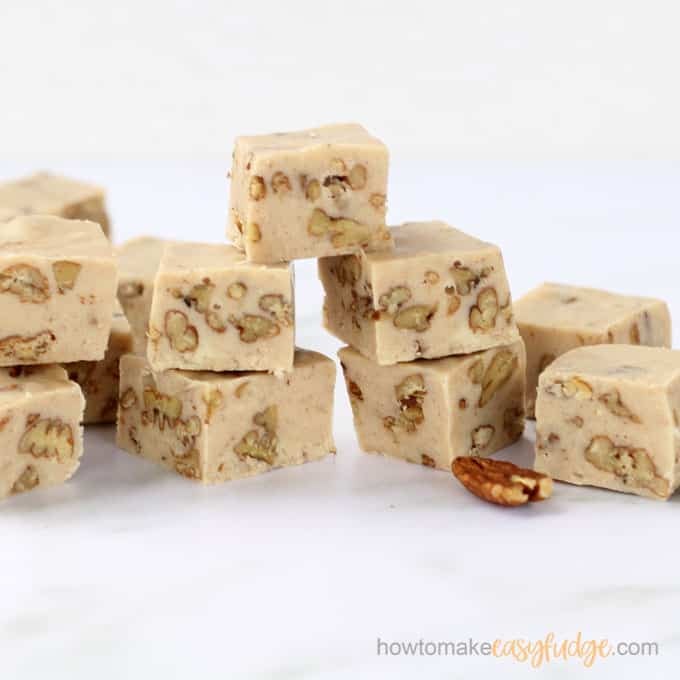 For the buttered pecans in this easy fudge recipe, place 1 1/2 tablespoons of butter in a saucepan. Melt over medium heat. 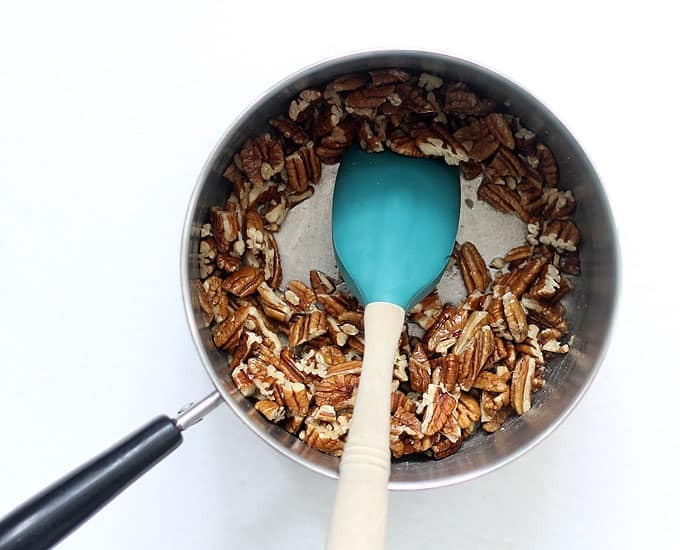 Add 1 1/2 cups of coarsely chopped pecan halves and stir with a spatula to coat with the butter. Continue heating over medium-low, stirring the pecans frequently, until the pecans are toasted, 3 to 4 minutes. 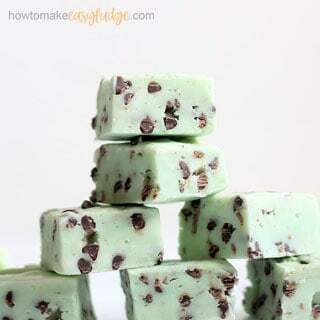 Pour out onto a baking sheet lined with parchment to cool before adding to the fudge. Traditionally, most recipes and bakers suggest using unsalted butter so you can control the saltiness of the dish. 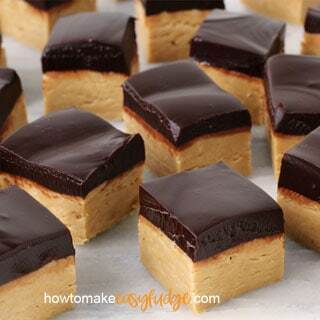 In our fudge recipes, I tend to use salted butter, because I think it balances the sweetness of the fudge. So you may choose either unsalted OR salted butter, depending on your taste preference. 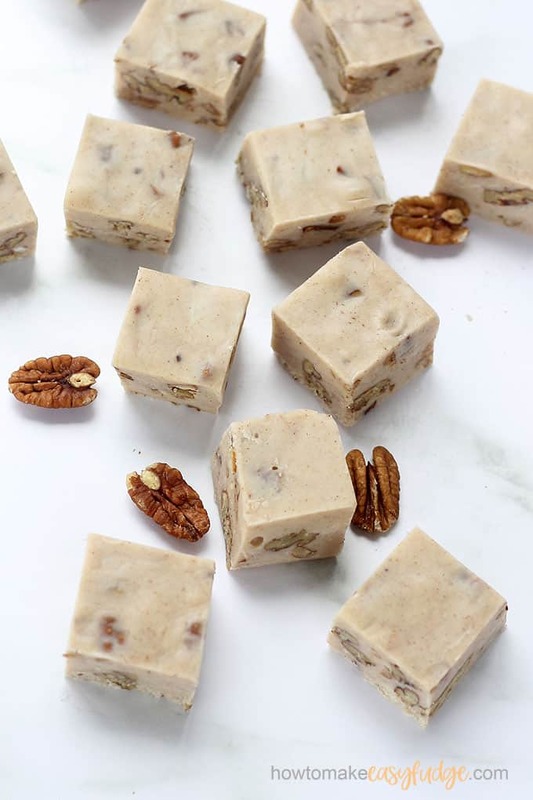 Delicious butter pecan fudge made with white chocolate, brown butter, buttered pecans, and cinnamon. In a sauce pan, brown 3 tablespoons of butter. Transfer to a bowl and set aside. In a sauce pan, melt 1 1/2 tablespoons of butter. Add the pecans and stir occasionally until the pecans are toasted, 3 to 4 minutes. Transfer to a baking tray lined with parchment paper to cool. Line an 8-inch square pan with non-stick foil. Set aside. 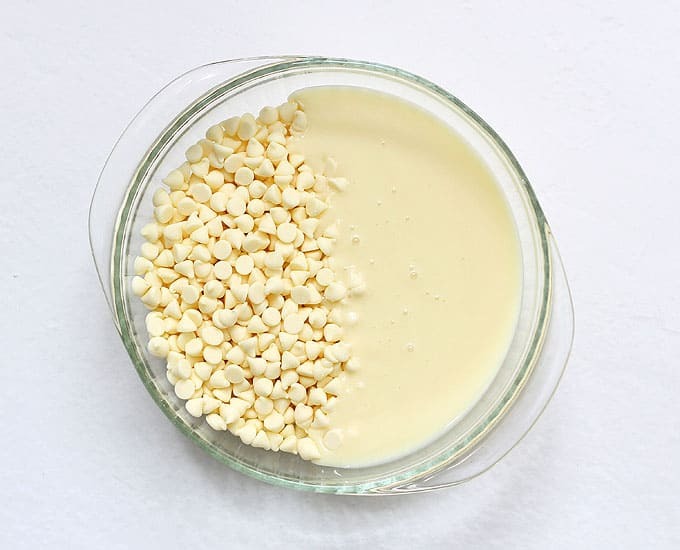 In a large, microwave-safe bowl, place the white chocolate chips and sweetened condensed milk. Heat for 90 seconds at 70 percent power. Stir, using the residual heat to fully melt the chocolate chips. If needed, add an additional 30 seconds in the microwave. Stir in the vanilla, salt, and cinnamon. Stir in the brown butter. Fold in the buttered pecans. Scrape the mixture into the prepared baking pan and spread evenly. Chill for at least 2 hours to overnight and cut into squares. 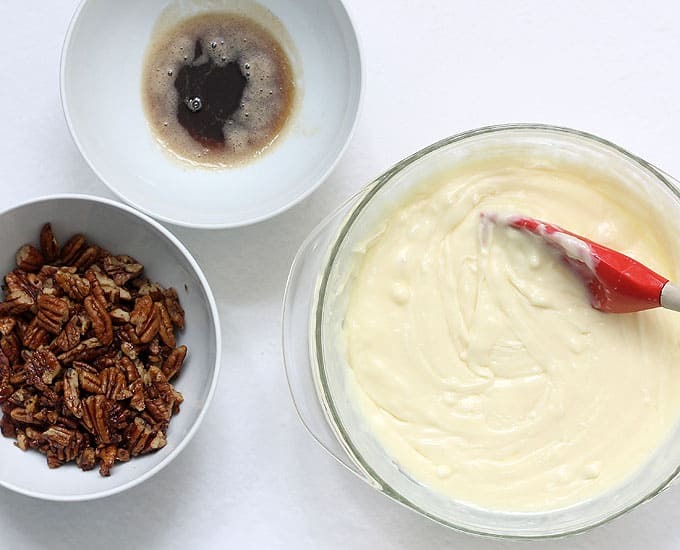 See blog post for tips on making buttered pecans and to learn how to brown butter. Now that you see how easy it is to make brown butter, why not try these recipes?